When you purchase a new mountain bike, the pedals might not always be the first thing you look at. However, the pedals do play a significant role in how the bike rides and how comfortable it is. Mountain bike pedals is a key component between you and the the bike. There are so many different recommendations and options in pedals online and from dealers. This buying guide will help you to know what you should look for, how to properly choose mountain bike pedals and give you a good idea of the best prices ranges and brands out on the market right now. Step 1: Decide on what type of terrain you want to ride on. Be sure to look for a pedal that works for the terrain you will be riding on. Most often platform pedals will work on a variety of terrains. However, if you are looking for off road pedals or or road pedals you maybe looking for different things such as toe clips, straps, or types of cleats. Step 2: Next you need to make a decision on what type of pedal you prefer. Remember there are 3 main types of pedals: clipless, platform and combo. Step 3: Find the right shoes for you pedals. You will need a special shoe for clipless pedals so that your shoe clicks into the pedal. If you are looking for road shoes they typically have stiff soles. Casual athletic shoes are typically the shoes with the most flexibility in the soles.Be sure to find a shoe that fits your comfortably. The sizes are typically U.S. or European sizes. When you are looking for the best pedals for the money, you have to keep in mind your preferences, durability and the cost of the pedal. You want a set of pedals with good grip that will last and not cost you a fortune. These platform pedals from Shimano are really great. They have good grip and with proper maintenance are quite durable. These Shimano platform pedals feature: a concave platform design for comfort and efficiency, replaceable pins and axle durability. They are made from alloy which allows them to be lighter and durable. These platform pedals are made to work with most bikes, not just mountain bikes. The price is quite a affordable, as well. Overall these pedals are a great buy for the money. When start out riding a mountain bike for the first time it’s about learning technique and what is comfortable for you. Most entry level riders will start out with platform pedals. This type of pedal is great for efficiency and ease of use. Be sure to look for an affordable set of pedals, as well. There is no need to spend a lot of money when you are just learning starting out in this sport. These pedals from RockBros are the perfect pedals for a beginner or entry level rider! They are flat platform pedals with excellent gripping. The RockBros Mountain Bike pedals are made from lightweight aluminium alloy and weigh about 1lb each. These pedals work with various style bikes including mountain bikes and road bikes. 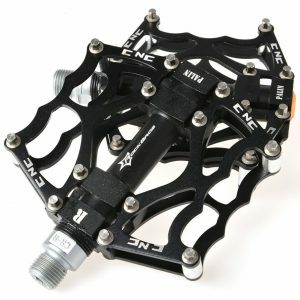 Overall these pedals are quite affordable and will come in handy for someone learning to ride a mountain bike. 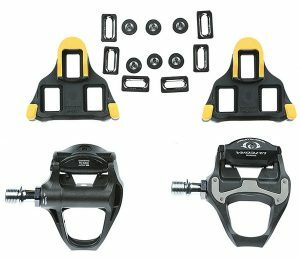 If you have been riding for a little while and want a great set of pedals yet you don’t want to spend a lot of money, a great set of clipless pedals that work with cleats for under a $100 might an ideal way to go. 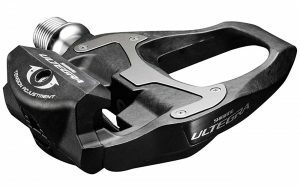 The Shimano Ultegra pedals are solid, well built clipless pedals. They are made from carbon fiber and have an aluminum cleat plate. This composition in pedals makes them lightweight yet really durable. They work well with most cleats and you can even order clip covers if you prefer them. The recommended retail price of these pedals is typically $200, however they are often on discount for around $100 or less! 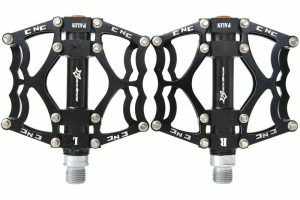 This makes these clipless pedals quite affordable. 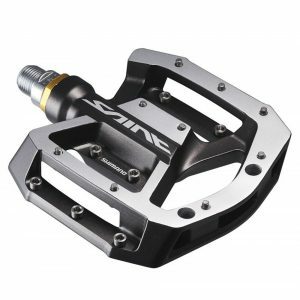 If you really want to spruce up your riding to the next level and don’t want to spend a fortune you really should check out these pedals from Shimano. There are so many great products on the market today. With so many options in pedals it is hard to choose a great pedal for your mountain bike. However, if you could find a nice flat platform pedal for under $50 then it just might be worth it to take a closer look at it. Flat pedals are an all round great pedal for any cyclists. 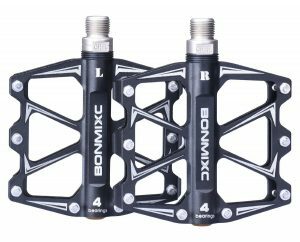 These pedals from Bonmixc are flat, dual platform, non slip grip pedals that make your ride smooth, comfortable and efficient. These pedals are made from lightweight aluminum alloy and are ultra thin in size. It features four sealed bearings, as well. This is a solid pedal that is affordable and built to last. There are several different things you should look for when looking at mountain bike pedals. These things can broken down into these categories: type, weight, size, material, and ratings. Type: There are three main types of all round pedals to choose from clipless, platform and combo pedals. These pedals define the type of riding you will be doing and your bike will interact with the surface you are on whether you are are on a trail or on asphalt. Clipless Vs. Platform: A platform pedal is a standard issue flat pedal. The other type is clipless where your your shoe clipped to the pedal. Most racers and professional riders prefer clipless pedals since because they are aid in in efficiency. Platform flat pedals are great for almost all bikers. They are especially great if you have bad knees. Platform pedals aid in a smooth ride and stability. They are especially great when you are working on techniques. Combo Pedals: Combo pedals are pedals that combine both platform pedals and clipless pedals into one. They give you both of the best worlds. The main disadvantage of these pedals are that they are often times a bit bulky and heavy. Weight: Typically a lighter pedal is ideal. However, sometimes you are trading durability for a lighter pedal. Be sure to look at what the pedal is made of and how durable it is before purchasing a new pedal. Size: The size of your bike pedals is important regardless if you choose platform pedals or clipless pedals. With clipless pedals a larger foot area size gives great support when you are starting out and increasing speeds. It also provides safety in case you shoe becomes unclipped. The only disadvantage is that a larger clipless pedal will increase the of the pedal.A large size platform pedal gives your foot stability.The only downside to a larger platform pedal is the risk of hitting rocks on the ground and if the pedal is too large you will have clumsy pedaling. Float: Pedal float is the degree of mobility you have when you foot is clicked into place. When someone is talking about pedal float they are talking about clipless pedals. You want the most float possible when using a clipless pedal this increases your performance on the bike. Material: Typically a mountain bike pedal is made from aluminum or even a low-grade steel. Choose a strong metal pedal for durability. Strong medal doesn’t necessarily mean a heavy metal either. Ratings: Always be sure to check out reviews and ratings on pedals before making a final purchase. It’s a good idea to really know what you are buying when it comes to your bicycle.